Beautiful engraved specimen certificate from the American Beef Packers printed in 1969. 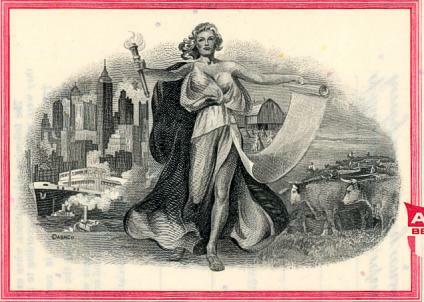 This historic document was printed by American Beef Packers Inc and has an ornate border around it with a vignette of an allegorical woman standing in front of a city. This item has the printed signatures of the Company's President and Secretary and is over 47 years old. 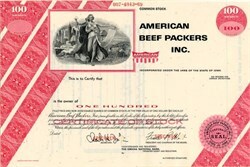 The American Beef Packers Company was started in the Texas Panhandle in the early '70's, and was short-lived, as they went bankrupt in 1975. The bankruptcy was just after many farmers had delivered their entire year's output of cattle, but before they got paid, and the farmers lost over $20 million. This led to an amendment to the Federal Packers & Stockyards Act. The assets were sold to Swift.